Portuguese sweet bread is a special treat, especially if it's homemade, that goes perfectly with softened butter and warm honey. With the chilly months coming up, it'll be making it's way back into our kitchen now that summer has past. The Sponge: Pour the water into a large bowl and dissolve in it the sugar and yeast. Stir in the flour and set aside until the mixture is bubbly and expanded. Don't worry about lumps, and feel free to give the mixture a stir after a few minutes to break up and distribute any clumps of yeast. The Dough: Scald the milk. Remove from the heat and add the butter, sugar, salt and optional lemon peel. Stir to dissolve and then let the mixture cool to lukewarm. 1. Beat the eggs and yolk together until frothy. Add them and the milk mixture to the proofing sponge. Stir in 6 to 7 cups of flour, one cup at a time, until the dough comes cleanly away from the sides of the bowl. 2. Turn the dough out onto a lightly floured board. Scrape the bowl and add the bits of dough. There is no need to wash the bowl at this time; just lightly oil and set it aside. 3. Knead the dough, adding only enough flour to keep the dough from sticking to your hands and the board. When the dough is smooth and satiny (it should be relatively soft rather than stiff), place it in the oiled bowl. Turn to lightly oil the entire surface of the dough. Cover the bowl with greased plastic wrap (to keep the dough from sticking to it) and a clean towel. Let the dough rise in a warm place until doubled in bulk, 1 1/2 to 2 hours. 4. Punch the dough down and divide into two equal pieces. Shape into two round loaves and place in two greased 9-inch cake pans. 5. Cover loosely with plastic wrap (again greased) and cover with a clean towel. Let the loaves rise in a warm place until doubled in bulk, about 1 hour. 6. Preheat your oven to 375°F for at least 15 minutes. Brush the loaves with the egg white and water mixture. 7. 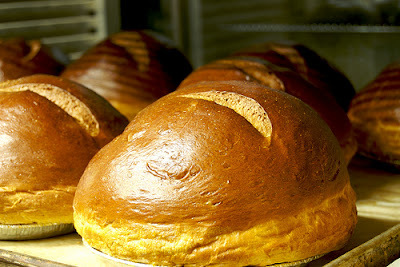 Bake for 35 to 40 minutes, or until the loaves sound hollow when tapped on the bottom with a finger. When the bread is done, remove it from the oven and let cool on a wire rack.